First off, if you haven’t been keeping up with the events leading up to yesterday’s Internet Shutdown and what SOPA and PIPA are all about there is a FAQ below. The whole movement kind of made me excited. I was excited to see a demonstration like I saw. Various websites (Reddit, Tumblr, Google, Wikipedia, etc.) allowed internet users to really get a piece of what our online lives could be like if bills like SOPA and PIPA passed. You go to look for/at something... and it’s just not there. 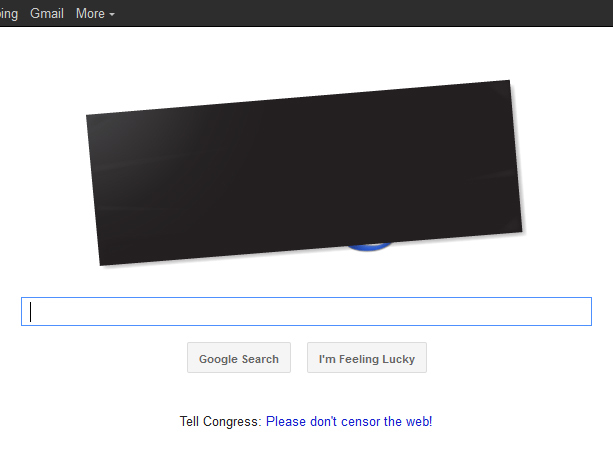 Censored, blacked out, at the whim of companies or the government. I think we entirely take the freedom of the internet for granted. That freedom is threatened by SOPA and PIPA. The first place I came across some anti-SOPA/PIPA action was Flickr. They gave users the option to black-out their hosted photos for the day. 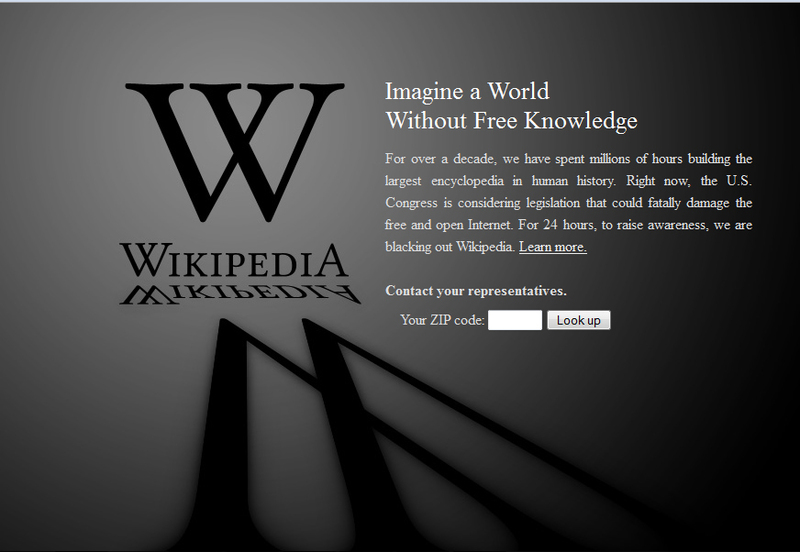 And there was Wikipedia, who blacked out their site for the day, and Google, who censored their logo. Who was I disappointed with? Facebook and Twitter. I’m not saying they needed to shut down. I think they played an important part in getting the word out about action steps against SOPA and PIPA. But I feel like they could have done SOMETHING. Give users an easy option to black out their profile photos, have a SOPA pop-up box or something. How dare you be two of the largest social networking sites on the internet and not do something to take a stand for internet freedom? What is the intent of SOPA/PROTECT IP? The stated intent of the bills is to provide tools for law enforcement and copyright holders to protect their intellectual property rights. What’s wrong with protecting copyrights? Nothing! The devil, as they say, is in the details. PROTECT IP and SOPA will cause too much collateral damage, have a high potential for abuse, and won't even be that effective at stopping the crimes they target. Read alienth's examination of where these bills fail. What are the differences between PROTECT IP and SOPA? At a general level, the bills are very similar. 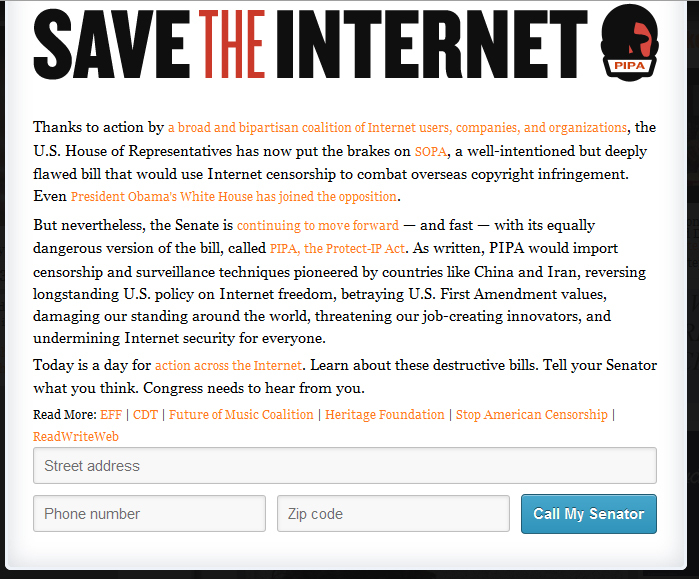 SOPA, the "Stop Online Piracy Act," is from the House of Representatives, while the PROTECT IP Act is from the Senate. Either or both bills may pass a vote in their chamber of congress on their way to becoming law. Both must be defeated to end this threat. There have recently been more detailed explanations in an ELI5 thread and alienth's blog post. Check out the /r/SOPA Community FAQ. Hey sis! Thank you for this timely post. You are right about twitter and facebook. I also liked how the english Wikipedia blacked out. It made us - me at least - realize how much we do take the freedom of internet for granted in the Western world. In addition, it made me remember those in other parts of the world that do not have such liberty. @Funbi - Very true. I think we forget sometimes that everyone's internet experience isn't as free as ours. These bills are quite scary. When government has too much power (it's taken from the people) they tends to abuse it. Also I'm sorry if this offends you but as a non American watching how American presidents over the past decade have run the country/how the population ostracizes people who disagrees (example Dixie Chicks and speaking out against G.W. Bush) the thought of the American Givernment having so much control over the conent of the Internet is terrifying. @Anonymous - no offense taken. It's important that the people can be heard, and don't feel afraid to voice their opinions. I was surprised that twitter and FB didn't do something as well. As much as I love those sites, I'm kinda disappointed in them that they didn't do it. Facebook gave news yesterday about doing it. @ A Buckeye Girl Reads - Yea, I would have thought they would have at least acknowledged it in some way.